Brick Making Machines,Fly Ash Brick Making Machines,Automatic Fly Ash Brick Making Machines. 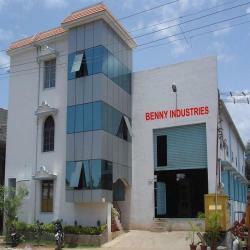 Established in the year 2005, Benny Enterprise, is an ISO 9001:2000 accredited company engaged in manufacturing and exporting quality Machinery for the Construction Industry. Our range includes Bricks Concrete Paver Machine, Automatic Fly Ash Brick Making Machine, Concrete Block Machine, Hollow solid block making hydraulics machine, Mosaic Tiles Machines . In addition to these, we also offer Designer Vibro forming machines, Concrete Planetary Machines, Pan Mixture and Concrete Mixture Machines. These machines can be operated manually or automatically as per the requirements of our clients. Widely used for building construction, these are appreciated for application specific design, precision functionality, optimum performance, longer serviceability, impact resistance and high tolerance and strength. We have with us state-of-the-art manufacturing unit, which assist us in catering bulk requirements of our clients. Moreover, our experienced professionals are highly competent and are able to comprehend the current industrial trends. Our team of quality controllers checks our enclosures on well defined parameters ensuring that these are in line with industry standards. Further, we also customize these as per the specifications detailed by our clients. Under the able guidance of our founder Mr.D. Benny, we have carved a niche for ourselves in the domestic market. With his sharp business acumen and industry knowledge, we are able to deliver excellent quality range of products. It is due to the dedicated work of our professionals and efforts of our owners, we have been able to gain support of our clients across the world. Social responsibility is an ethical or ideological theory that an entity whether it is a government, corporation, organization or individual has a responsibility to society. We carry out our role as a responsible member of society seriously and act in accordance with economic, ecological and social principles – in order to remain successful in the future. We are ardent related to sustainability, which covers different issues, including reducing energy or water consumption, encouraging economic regeneration and local employment, as well as minimizing the impact of construction activities on the local environment. Our activities are guided by economic, ecological and social principles for decades. Moreover, we strive for economic success in accordance with nature and mankind. We are supported by a team of experts, who are able to meet with all the demands of the clients. Moreover, they also take the responsibility of keeping pace with the ever changing market evolution. We have teams of experienced professionals, who provide the optimum solutions for our Machinery for Construction Industry. We have other team members for job like logistics and transportation, warehouse, sales and marketing and packaging. Having several years of experience in the industry, our group members give their best effort in meeting with each specific requirement of the clients. Moreover, their understanding, awareness and knowledge have come with immense benefits to us.